So you have an upcoming hardscape project that involves natural stone. Whether you’re installing a new travertine patio or sealing an existing bluestone walkway, it’s time to brush up on some geology before getting to work! 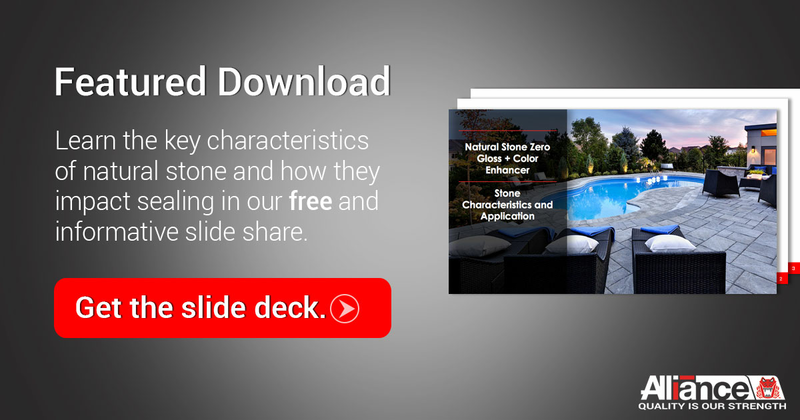 Start your stopwatch because we’re about to hit the key characteristics of natural stone in only four minutes! Ready. Set. Go! Density simply refers to the weight of a stone and is measured relative to the density of water (1 gram per cubic cm). Most types of stone in the earth’s crust have similar densities. A dense stone like granite will offer superior durability and strength. Other examples of dense stones include basalt, dolomite, and slate. Porosity is the amount of open space between mineral grains in a stone (and generally dictates permeability). A very porous stone, like sandstone, will absorb liquids quickly. Since all natural stones are porous, they are susceptible to staining, etching, spalling, etc. Permeability is the ability of liquids to move through a stone. While permeability is closely linked to porosity, a stone can have low porosity and high permeability depending on its grain structure (i.e. bluestone). This is a key characteristic that needs to be front and center of any natural stone project. Absorption will determine two very important things: 1. How prone the surface will be to staining and 2. How to properly protect that surface. Stones such as limestone and sandstone feature high absorption rates. Absorption is also a key factor should homeowner decide to seal their project. Stop the clock because you’re now up to speed on the four key characteristics of natural stone!